STILL BLOOMING: This woman ---> naturally elegant, warm and generous Patti. If there ever was a list of "must read" blogs for plus forty something ladies, her blog is definitely one of them. 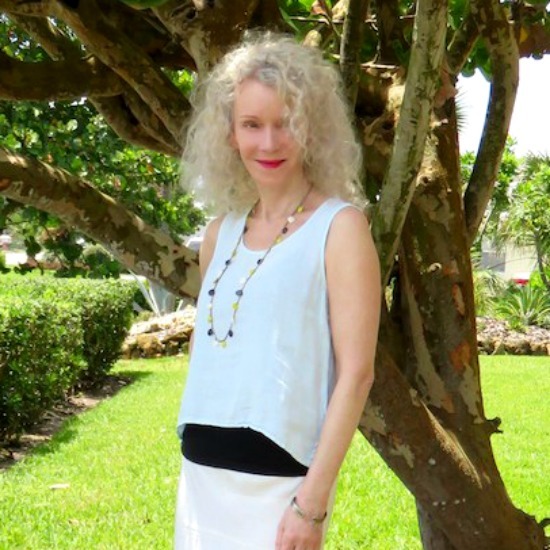 Patti's Not Yet Dead Style is a great source for thoughtful comment as well as real life outfits and it is a hub a a vibrant community of +40 women who are exploring the subject of personal style. While I've never had the pleasure of meeting Patti in person, I can tell from corresponding with her that she is as effortlessly elegant, warm and generous as she appears on her blog. And we've had the honor of helping her equally lovely husband pick out some of her birthday presents over the course of the past 3 or 4 years, which I must say, feels pretty neat-o on our end of things. Mr. Net Dead Yet, aka Sandy G, has a great eye for birthday treats, and this year was no exception- he picked out a great piece, a handmade chunky goldtoned metal cuff, upcycled from vintage costume jewelry. 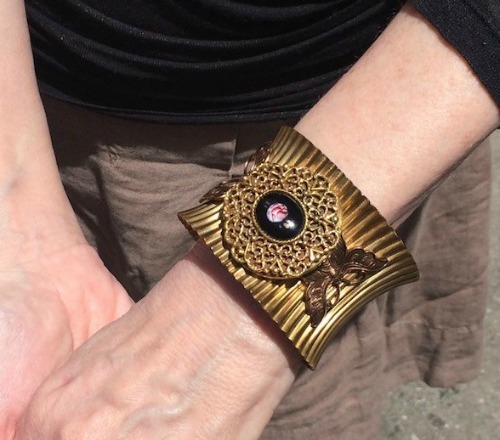 On Patti's wrist, it looks like a million bucks! It's a piece acquired from a local artist while living in Sacramento, California. Creatively put together from various vintage items, this retro redux looks at once modern, vintage and funky. Re-use and upcycling old broken jewelry is such a great way to get extra life out of old things, and shows that style truly is eternal! DO check out Patti's style party link-up (almost) every other Monday, and her awesome Not Dead Yet Style. Also check out the latest FRESH PICKS from our vintage Spring/Summer stock in our Etsy shop! Use coupon code ROSEBUD for 10% off your next order. Patti is beautiful. I love that bracelet! !